A brief diversion from bees today. 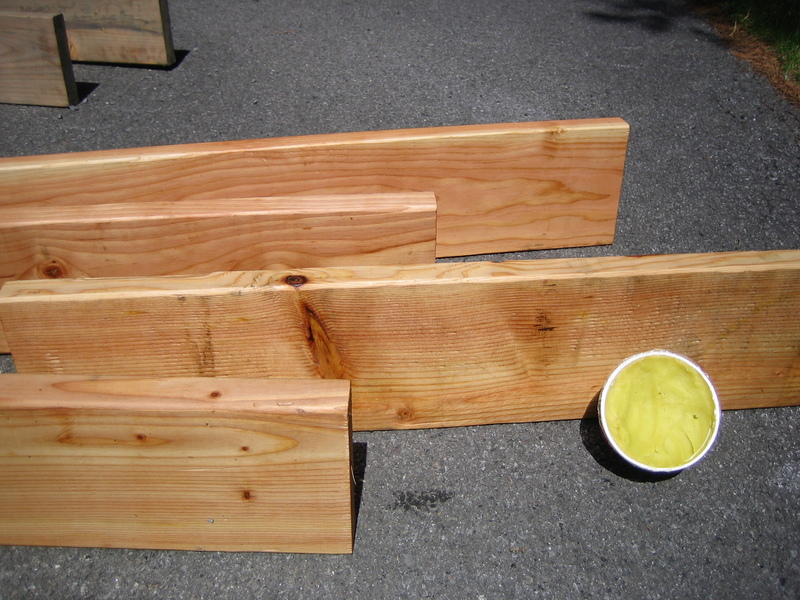 I’ve been planning out some new raised beds for vegetables and have been searching for the best wood preservative that won’t leach toxic nastiness into the soil. 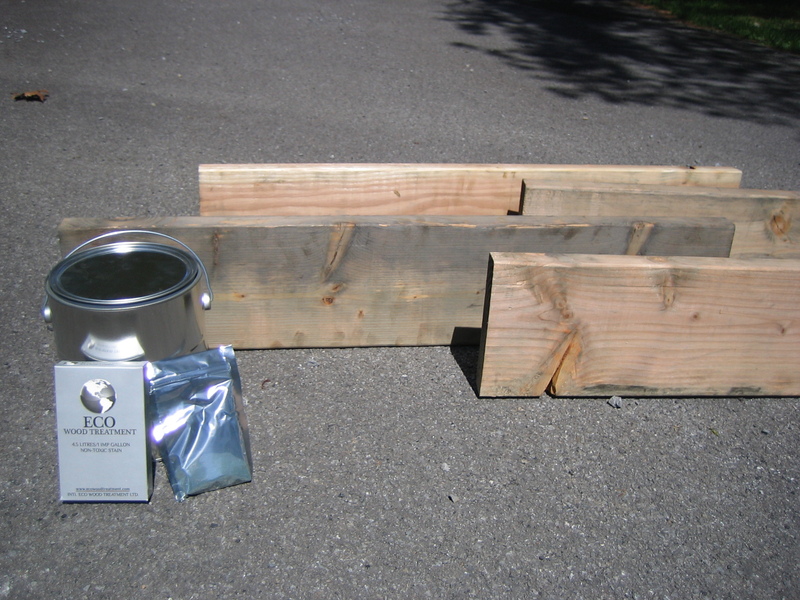 A little context: Pressure-treated wood today no longer contains the arsenic compound it used to, so it’s supposedly not toxic anymore and ok to use for garden beds. There’s still some question about copper compounds leaching out of the new stuff, though, and the concern that it might be toxic as well, so I’d prefer not to use even the new pressure-treated stuff if possible. All “normal” paints and stains supposedly leach stuff, too, so I’d prefer not to use them. Now, how much does all this leaching really matter? Is paint or stain from the raised beds really going to leach enough chemicals into the soil to get into your veggies? I really don’t have a clue. Even the copper leaching from the new pressure-treated wood is likely to kill your plants before you can harvest them. But I figure that we get enough chemical exposure elsewhere in our lives, and as long as I’m growing my own stuff, why not be as chemical-free as possible? Also, I can’t do anything simply. It’s my lot in life to over-think everything. What about not treating at all and just replacing the beds as they rot, as is advocated by some gardeners? Sure, this is likely the least-toxic option, but I think not. I’m pretty sure I can find other things to do with my time than rebuild my garden beds every 2 or 3 years. Milk paint: Literally made from milk. Lots of different recipes, but they’re all pretty similar–and pretty much just milk protein (i.e., curds). I could write an entire post on milk paint, but plenty of people have already done that. Feel free to google. Beeswax & olive oil: Most recipes call for food-grade mineral oil. I didn’t have that, so I used olive oil. Don’t know if it’ll work the same or not. Au naturale: The control–no treatment. 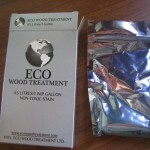 Eco Wood Treatment: This was definitely the easiest of the three. Just dump the packet of powder into a gallon of water, stir, and you’re ready to go. The powder stores indefinitely (supposedly) and comes in a resealable bag, so you can mix up as much as you need. I mixed up half a gallon, and it was way more than I needed for the amount of wood I was doing. The prepared liquid supposedly lasts a while, too, as long as it’s stored in an air-tight container. I just bought an empty paint can from the hardware store for a few bucks. Bought the powder itself online at Home Depot; they don’t seem to carry it in their stores, just online. Milk paint: This is the weirdest one, but everywhere I read says it’s a really durable paint. 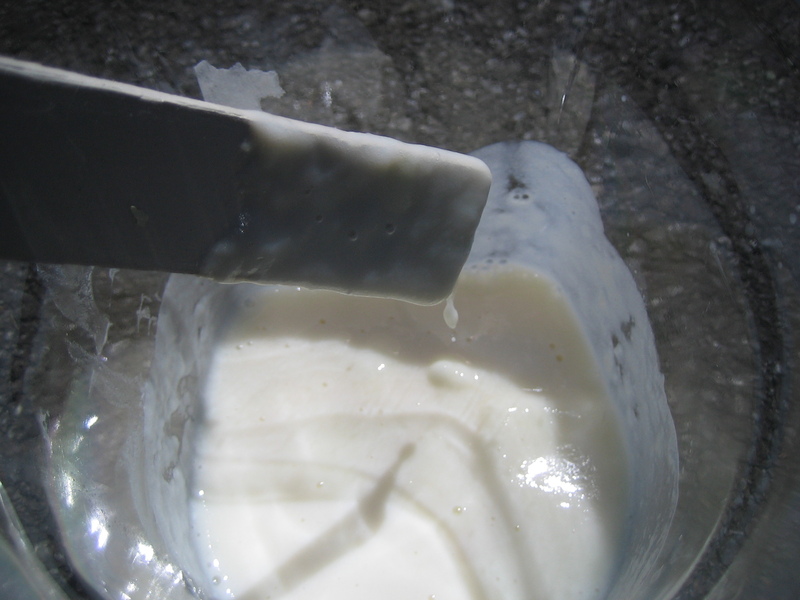 You curdle some skim or 2% milk (not whole milk, apparently), drain off the liquid, mix in a tiny bit of borax, and you’re good to go. So it’s pretty much cheese curd. In fact, one site I found says to just use cottage cheese if you don’t have time to curdle your own milk. 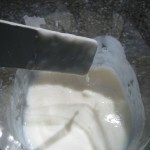 There are LOTS of variations on this recipe (e.g., some mix the borax right into liquid milk and use that as the paint, without bothering with the curdling), and I have no idea if one is better than the others. But they’re all basically the same idea. Really bizarre, regardless. I have a hard time believing this will work to protect wood, but it’s apparently very durable. Used to be used in the “pioneer days” for painting barns and houses and such. Guess we’ll see. I’m guessing the particular recipe may have an effect on durability. Beeswax & oil: This one’s pretty simple to make (though not quite like mixing powder and water). 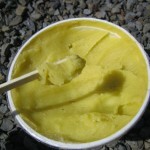 Just combine four parts oil to one part beeswax, heat until the wax is melted, mix, and let it solidify. It turns into a nice, soft wax, kind of like Crisco or car wax. I used 2 cups of oil and half a cup of wax and melted it all together in the microwave. Probably would have been safer to do it in a double boiler on the stove, since beeswax needs to get really hot before it melts. Ran the risk of shattering the bowl. But it worked ok. This amount yielded about 2 cups of “polish,” which was WAY more than needed for a 3′ x 3′ bed. 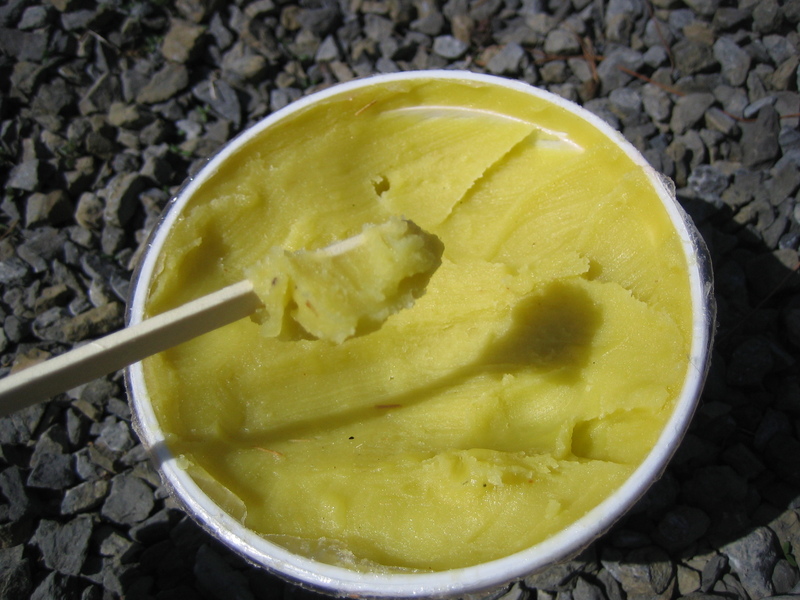 The hardest and most time-consuming part for me was shaving off the beeswax from a big block. You can probably get shaved beeswax or small blocks that make for easier measuring, which would make the process even simpler. Most of the “recipes” I’ve seen for this call for food-grade mineral oil. Supposedly it’s pretty easy to find, but I couldn’t find any. I was in a hurry, though, so I didn’t look too hard. I just settled for olive oil–it’s cheap and available. Don’t know how it’ll work, but we’ll see. Eco Wood Treatment: I thought this would go on pretty easily, since you just put it on with a brush, like paint, but I found it pretty messy. It didn’t absorb into the wood quickly at all, just kind of ran around on the surface. So there was a lot of drippage involved. 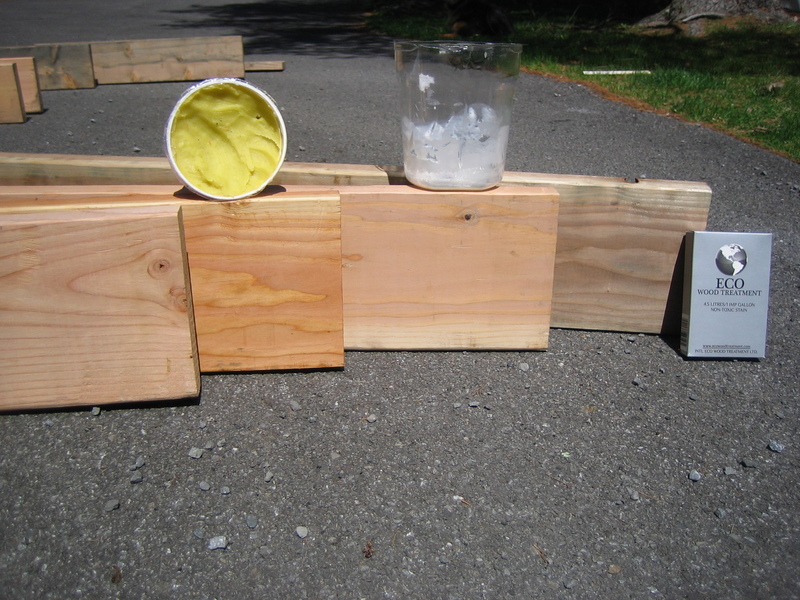 A note here: The instructions say that if you’re going to use this on wood that will be installed in the ground (like fence posts–or garden beds), you’re supposed to immerse the wood in triple-strength solution for three days. Um, no. I have neither the patience nor an immersion tank big enough for such an endeavor. So if it doesn’t protect the wood like it says, I can’t exactly blame the product, since I didn’t technically follow the directions. But it’ll give me a comparison for the lazy-man’s way (i.e., my way). Beeswax & oil: This was definitely the most work and the messiest, but I found it enjoyable. I put it on with a rag, like furniture polish or car wax. I say “messiest” because it was, well, a messy wax. But because I used olive oil instead of mineral oil, it was amazing for my hands. So I just rubbed the “mess” into my skin. I think it’s the only outdoor chore I can do that leaves me with nicer hands than when I started. It also never actually dried, while the other two did, so the boards stayed sticky. I suppose if I went back and wiped off the excess like you do with car wax, it’d be better. But again: lazy. 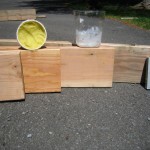 I also figured that it can’t hurt to have extra wax & oil on there to help keep water away from the wood. 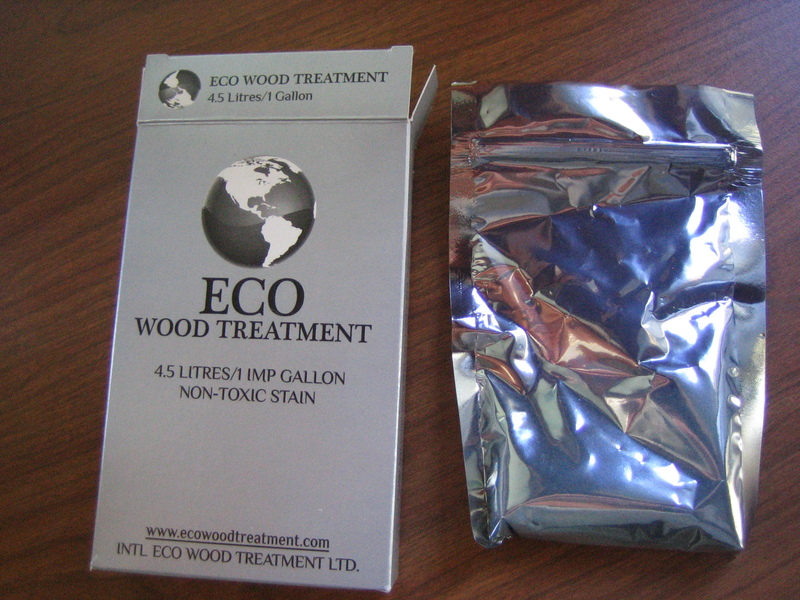 Eco Wood Treatment: According to their website, this gives the wood a “silvery patina/high-end aged weathered look.” And that’s just what it does. 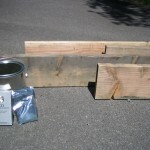 The wood is very gray, within just an hour or two of application. This may be what you’re going for, and may fit in nicely with some gardens. I just don’t particularly like the look for my garden. You can actually buy this with a pigment added and have colored wood instead of the aged look; I just didn’t. Milk paint: This resulted in a clear matte, so it looks almost exactly like the untreated wood. Pretty nice. It’s also really easy to add pigment to this, if you want your wood to be colored. Beeswax & oil: This one is quite lovely. It really enhances the natural color of the wood. 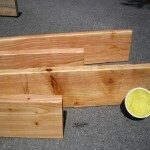 I think my boards are douglas fir, which is a little bit more red than pine. With the wax/oil, they look almost like cedar. Really pretty. I have no idea. Performance-wise, at least. It’s going to take several years to find out which one holds up to the weather the best. But as I have more raised beds to build before then, I have to decide what I’m going to do with the rest of them. I think I’m going to go with the wax and oil mix. I have a bunch left over, it looks beautiful, and you can’t get much less toxic that beeswax and olive oil. It makes sense to me that wax and oil would protect the wood at least as much as the other options, too, but only time will tell. 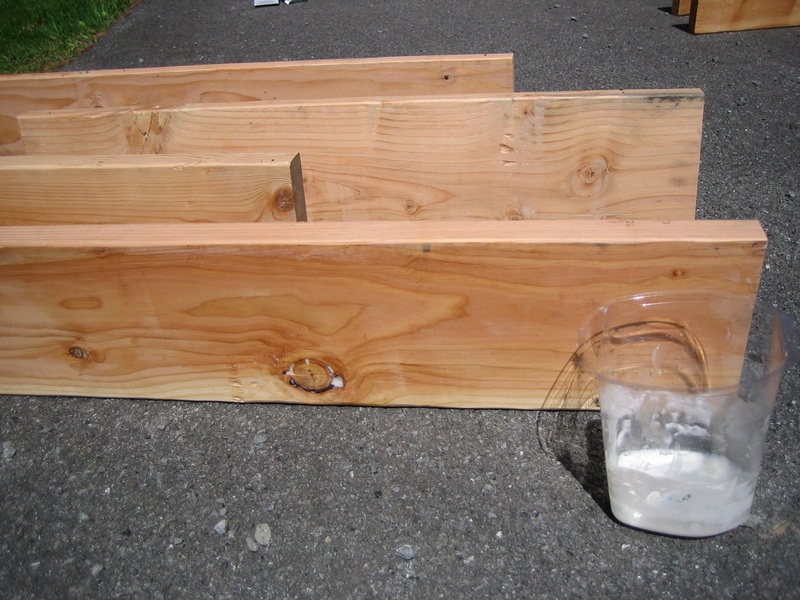 If I run out of that, I may make more milk paint, just because it would be a little simpler to make (if I use ready-made cottage cheese or just liquid milk). So that’s my story. Check back in…oh, two or three years and I’ll give you the scoop on how they perform in a New York climate. How are the different products holding up? Just purchased VegTrug and need to apply wood preservative. Leaning towards the Eco Wood or beeswax/oil…after a year, which would you recommend? Any problems with insects using the beeswax combo? Thank you. Oh, thank you for reminding me! I forgot I wanted to do a follow-up on this. I’ll do a post on this soon! Any chance of a write up? Really liked the beeswax and very curious as I thought about purchasing the weird Eco Wood Treatment. Thanks for your interest! I’ll provide a 3-year update in the next couple of weeks. The beds will last a good while with out any protection. 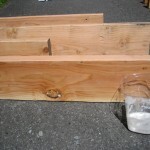 Next time try building the boxes out of a rot resistant wood like Black Locust. But if you must seal the wood the way to go is with a product called Penofin. It is food safe. Or another way to go though likely as or more expensive is to use linseed oil and thin it down then apply it like a stain,. I’ll have to check into Penofin. Haven’t heard of that one. Thanks!